The Government can file its own False Claims Act cases, but most FCA cases are filed by whistleblowers. But considering how much money the US is losing to fraud each year, the number of cases filed each year is shockingly low. The U.S. estimates that it loses $80 billion a year to fraud. To try to stem the tide, the U.S. passed the False Claims Act to incentivize whistleblower to file suit to get the money back. A successful whistleblower gets 15% – 30% of what he helps the Government recover. But despite the incentives, and despite the gargantuan losses being incurred each year, somehow whistleblowers have never filed more cases than they did in 2013 – and that year whistleblowers filed only 755 qui tam cases nationwide. From World War II through 1987, the False Claims Act was all but dead. Gutted during the war, the Act gave whistleblowers little incentive to file suit. In 1987, Congress amended the False Claims Act to make it easier and more lucrative for whistleblowers to file suit. The results have been dramatic – the number of cases filed by whistleblowers has increased many fold, as have the dollars recovered by the U.S. In that year, only 30 qui tam cases were filed in the entire United States. But with the passage of the amendments, the number of filings began an uptick. The number peaked in 1997, when whistleblowers filed 547 cases nationwide. By 1998, relators and their counsel began to realize that the new qui tam amendments were being interpreted very narrowly by the courts, which was making it very difficult for relators to win qui tam cases. Filings trailed off to around 400 cases a year, nationwide — higher than before the 1987 amendments, but still shockingly low. In 2009 and 2010, Congress decided to strengthen the Act to make it easier for whistleblowers to file suit. In a series of three amendments, Congress made changes to the law to address the negative case law and unintended legislative restrictions that had made it difficult for whistleblowers to win their cases. The response was quick. In 2010, whistleblowers beat the previous record, filing more cases nationally than ever before — 576. 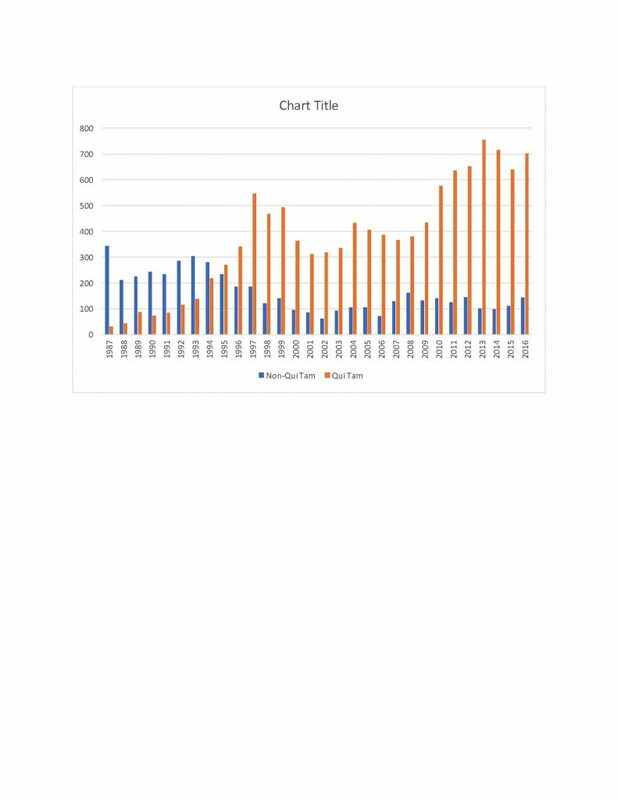 By 2013, qui tam filings had soared to 755, still the record number of cases. The number of filings dropped to 715 in 2014, and even lower in 2015, when the number fell to 639, before rallying slightly in 2016, when 702 cases were filed. Although the number of qui tam cases increased after the amendments, the overall number remains shockingly low. Given that the Government loses tens of billions a year to fraud, it seems almost inconceivable that only 700-some odd cases are filed each year. Congress has made two rounds of serious amendments to the FCA, and each time the response was clear and gratifying. After the first amendments in 1987, case filings grew at a steady and rapid rate. Ten years after the amendments, whistleblowers filed 17 times as many cases as they did in 1987. Case filings jumped again after the 2009 and 2010 amendments. The moral of the story? As Congress addresses the problems in the Act to make it possible for whistleblowers to win, whistleblowers will respond and more cases will be filed.